This is the third photograph of the Forum Chriesbach building at the Swiss Federal Institute of Aquatic Science and Technology (EAWAG) that I am sharing in my nearby series. 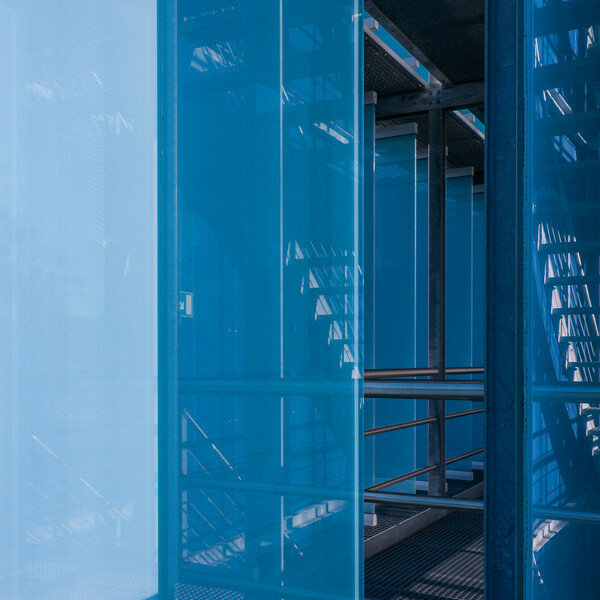 Here, you see the staircase in between the mobile, blue glass panes and the main building itself. In this composition, I like how the blue panes and the reflections of the stairs and the handrail create a kind of repetitive pattern. On the leftmost glass element there is again a hint of a moiré pattern (as in earlier compositions of the EAWAG and PWC buildings).